SPECIAL COMPARTMENT in medicine chest that locks to prevent little hands getting at harmful drugs. Bob Ewing, Mishawaka. Ind. LIGHTWEIGHT PLASTIC DOME to fit over bicycle would keep newsboy, papers dry in wet weather. Ronald Hale, Bloomfield, Conn.
GLASS CUTTER with small emery stone on its topside to save Pop time looking for sandpaper. Joseph Orbanski W. Concord. Mass. FIREPROOF CLOTH, 10×10, enabling home owner to bum refuse on grass, walk, etc., not leave any marks. Andy Staub, Glenview. Ill.
PIVOTING RADIATORS that swing outward so Mom can make short work of cleaning behind them. 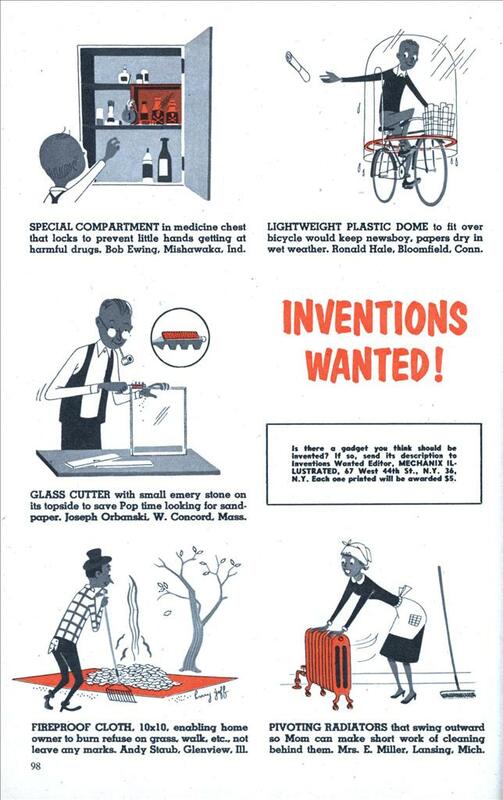 Mrs. E. Miller, Lansing, Mich.
cast in their “Inventions Wanted!” feature. Well…. at least she doesn’t look like the maid on that sitcom. The person with the “little hands” looks like he has male pattern baldness. My Mom would have loved those pivoting radiators. We lived in two different row homes in Baltimore, MD in the late 55’s to early 60’s. I would love pivoting radiators in my current house. Not only can’t you clean behind them, it’s devilishly difficult to paint behind them too. I once lived in a barracks with them, and with no vacuum cleaner. Inspections were always fun. My solution was a set of long kitchen tongs and tube socks – they worked well on the venetian blind slats as well. It was as if they went out of their way to design a barracks that would be a dust trap. I guess the smell of burning leaves will distract you from the fact that you’ve got a giant push pin through your head. I am thinking that once the newspapers lands on the front lawn, it is going to get wet. @Mike – But at least you know you’ll always get your paper, because that plastic dome is the antithesis of a chick magnet, no distractions for that paperboy!